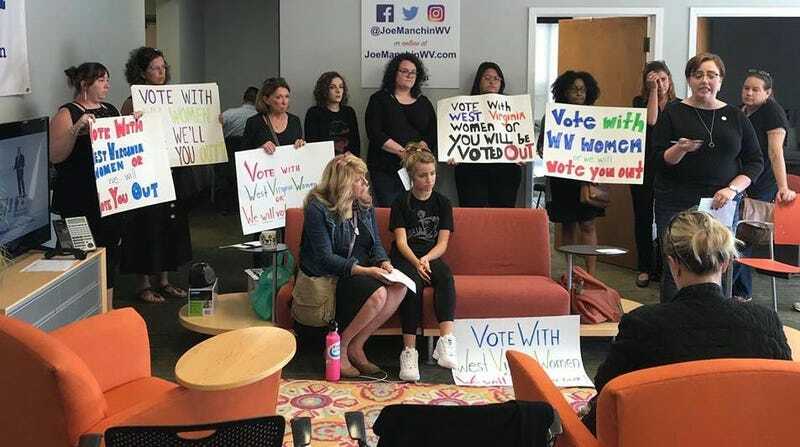 A group of women are occupying the campaign office of West Virginia Democrat Joe Manchin, demanding the senator vote against Supreme Court nominee Brett Kavanaugh. If Senator Manchin commits to voting no on the Kavanaugh nomination, they will donate funds to REACH, a West Virginia organization that provides free counseling services to victims of sexual assault and abuse. If Senator Manchin votes yes on the Kavanaugh nomination, these women will use the funds to recruit, train, and support pro-women candidates in West Virginia who they say “believe the stories of survivors” - including a future primary challenger to Senator Manchin, should he run again after this 2018. Manchin was one of three Democrats to vote for Trump’s first nominee to the high court, Neil Gorsuch.